How many times have we seen the Adirondack mountains ranked by height, the tallest 46 separated into a revered category of their own? There’s a club and way of life dedicated to hiking the 46, and a Lake Placid restaurant offers 46 different sandwiches named for the peaks. For a change, today we list the largest streams in the Adirondack region. * » Continue Reading. It was small. Black . . . with a reddish band across the middle. It scuttled across the kitchen counter on six short legs. I had to swat at it more than once to kill it. It was . . . a larder beetle. Larder beetles (Dermestes lardarius) are also known as bacon beetles, and, as you may have guessed, they are frequently found in our kitchens. A member of the scientific family Dermestidae, these insects, while at once creepy and revolting, serve an important function in the world: they clean up messes. That’s right. In general, dermestids are scavengers, feeding on skin, carcasses, old plant fibers, feathers, dead insects, and so on. They are right helpful out in the wild, but in our houses, they make us wonder about our housekeeping skills. The larder beetle, and its cousin the carpet beetle (there are more than one species) are probably the dermestids most commonly found in your house. Let’s start with a look at the larder beetle. It is small (a centimeter long at most). It is black at the head and tail ends, with a reddish band running across the middle. Sort of like a woolly bear caterpillar. And it is in your house because there is food there for it: animal-based products. It’s not called a bacon beetle for no reason. Often these insects are found in warehouses, places that store fatty meats (such as bacon), hides, carcasses, etc. Slaughterhouses are probably a good place to look for them, too. So why do we find them in our kitchens? Most of us don’t have hams hanging in the rafters anymore. If we have meat, it is in the fridge or freezer. Why, I was a vegetarian for seventeen years, and I still had them! What could they be eating? After due consideration, I finally decided it must be the cat (and later, dog) food. But then I read about the larvae. When larder beetle larvae are ready to pupate, they develop prodigious appetites, eating all sorts of household products that would turn our stomachs: wood, cork, paper, textiles, mortar and soft metals, like lead. Well, they aren’t really eating these things, per se. They are actually chewing holes in them to make cozy little dens in which to go through “the change”. Still, they are chewing our stuff. And once they pupate, they are adults, and perhaps it is these newly pupated adults that I am finding in my house. Carpet beetles, on the other hand, are less fussy – they are simply eating any animal-based product that contains keratin (old fur, old hair, old feathers, old insect parts), although some are also attracted to plants (nectar, pollen). They range in size from one-quarter inch to one inch in length, and they vary in color depending on species. If you have animals in your house shedding away (and what animal doesn’t, with the possible exception of those Egyptian sphinx cats and naked molerats), then your house could be a good candidate for these insects. And the species that like wool can wreak havoc on your precious Persian carpets! One source I found even claimed that carpet beetles can cause allergies, a direct result of our inhaling the shed hairs of the larvae. Ick. We need to remember, though, that in the wild these insects are really beneficial. They are part of nature’s janitorial crew. Thanks to their yen for skin, fur, feathers, carcasses, we are not surrounded by dead things. Why, they are so industrious that I lost an entire study skin collection to dermestids several years ago (imagine my horror when I opened my collection, which was stored in a wooden wine box, to find nothing left but a pile of dust and wires); they had to be pretty determined to find it. Admittedly, I wasn’t too thrilled, but it is this ravenous desire to consume all things once living that makes dermestid beetles the friends of bone collectors. Bone collectors? I know, it sounds grisly, but in truth it’s not that bad. There are folks who prepare bones, like animal skulls, for display. I have skulls at home, and many nature centers also have collections. And how do you get your bones to be squeaky clean and suitable for display? You bury them with a bunch of dermestid beetles, who will happily remove all remaining skin, fur, feathers, flesh. You can cut down on the likelihood of having dermestids in your house by keeping your house clean. Vacuum up the pet hair. Scrub the counters. Keep meat in the cold chest. Make sure everything in the cupboard is well sealed. And if a little visitor should happen to show up (perhaps it pupated in your walls), just scoop it up and toss it outside, where it can feast on nature’s bounty safely beyond your eyesight. “When will the colors be at peak?” Every year, starting in early August, we get asked this question countless times. We are tempted to give answers like “September 26th at 4:43 PM,” but in truth, one can never know. Predicting the fall colors is about as reliable as predicting the weather – you can only know for sure when it is happening. Around here, colors start to change in July. Many folks gasp when I tell them this. Isn’t that a bit early? No, not for us. The central Adirondacks have a very short growing season, and as such our springs arrive later and our falls arrive earlier. For those who have a hankering for a spot of color early in the season, the central Adirondacks is the place to be. Want to wait for peak color? Then schedule your trip for late September or early October; if you are lucky, you will catch it in time. From year to year, the fall color show can be a surprise. Some years the colors are simply stunning – reds and oranges set the hillsides a-glow like so many embers fanned by the wind (this is one of those years). Other years the colors are just “okay.” And then there are the years that are complete duds. Fortunately, the latter are few and far between. We had a dud a couple years ago. The colors were not spectacular, and then the leaves dropped suddenly, all at once. It was a real disappointment for the leaf peepers. Leaf peeping, as you can probably imagine, is one of the big tourist draws for the Adirondacks, and one of the many things I do is provide Fall Foliage reports for the central Adirondacks. Once a week I send in my report, rating color, guessing percentage of change, and trying to select the best viewing spots. It can be tricky, for it often depends on where you stand. It might be only 50% out my window, but two miles to the east the forest could be 90% changed, while two miles to the west it could be only 30%. Not only that, but what may be 20% when I send in my report might be 70% before the week is out! How can you tell if it is a good year? I think dark, cloudy days are the best indicators: if on these days the mountains still glow, you know you have a great season on hand. If you are looking for a good leaf peeping experience, you can’t miss right now if you drive through the central part of the Adirondack Park. Most of the hillsides are very colorful, creating some wonderful reflections in our many lakes and ponds. Once you hit the lower elevations, though, colors are not quite “there” yet. Give them a couple more weeks and they should be pretty good. There are lots of plants out there that really grab you…literally. We’ve all encountered at least one, probably more. With hooking barbs or puncturing spikes, they lam onto our shoes and socks, pant legs and shirt sleeves – and heaven help you should you be wearing a woven poncho when you have your run-in with them! Our dogs return from a romp in the field with seeds of all sorts clinging to their fur. Yep, late summer and fall are the time of year to get to know your seeds. » Continue Reading. Language. It’s supposed to make communication easier, but sometimes it ends up just confusing issues more. Take plant names, for example, specifically mosses. If I say “moss” to you, you probably picture some dark green, low-growing, soft groundcover in the woods. And for the most part, you’d be right. But what about reindeer moss? It’s not a moss at all; it’s a lichen. Clubmoss is another misnomer – the plant may actually look like a large moss, but it isn’t. In fact, it is more closely related to ferns than it is to true mosses. Clubmosses, which belong to the family Lycopodiaceae, are vascular plants that do not have flowers and that reproduce sexually by means of spores (like mushrooms, ferns and true mosses). Clubmosses have stems, which true mosses don’t, and the sporophyte, at least, has real roots – true mosses don’t have roots. Here at the Newcomb Visitor Interpretive Center, we have three very common clubmosses: Princess Pine (Lycopodium obscurum), Shining Clubmoss (L. lucidulum), and Stiff Clubmoss (L. anotinum). You can also find Running Clubmoss (L. clavatum) – this is the one pictured above. Princess pine, as you might expect, looks a lot like a miniature conifer tree. Also called ground pine, at one time it was harvested extensively for holiday decorations. As with many wild harvesting “programs,” gatherers did not make much money for the time and effort they had to expend. As a result, when patches of the desired plant were found, they were often cleaned out. Such unsustainable harvesting practices resulted in many plants becoming rare. Today clubmosses are among the many native plants that are protected by law. When I started my career as a naturalist, one of the first things I learned about lycopodium was that the spores were used historically for flash powder. We’ve all seen westerns, or other movies that portray life in the 1800s. Whenever you saw a photograph being taken in that time period, there was a guy (usually) with a big box camera draped in black cloth. He would hold up a t-shaped bar, tell everyone to hold really still, and then flash! bang! the cross bar would explode and the photograph was taken. The stuff that flashed was clubmoss spores. Like flour in a mill, the fine dust-like spores, which are very rich in oil, are highly flammable. Unlike flour, however, the spores burn fast and bright, but with little heat. No theater stages (flash powder was used to simulate lightning) or photo studios burned to the ground because of flash powder. It turns out, however, that clubmosses had many more historical uses. According to a couple sources I found, the Woodland Crees would rub raw fish eggs into stiff clubmoss to separate them from their gelatinous membranes. After they were separated, the eggs were used to make fish-egg bread. It doesn’t appeal to me, but then I’ve never tried it – maybe it’s pretty good. Clubmoss spores found their way into surgery as a dusting powder, and were even used to treat conditions like eczema. At one time the spores were popular as baby powder. This might be because they are water repellent. Apparently if you cover your hand with the spores and then submerge it in water, it will not get wet! But that’s not all. Spores from L. complanatum, commonly called groundcedar, were used by the Blackfoot people as an antiseptic and to stop nosebleeds. They also used the entire plant as a mordant, which is a compound used to set dyes. What about mystical powers? The Dakelh people of British Columbia at one time used clubmoss spores to determine if the sick would survive their illnesses. The divination process was simple: spores were dropped into a container of water. If they drifted in the direction of the sun, the patient had a good chance of survival. I’m not sure I’d want to rely on this for my own survival, but in a time when penicillin was unheard of and belief in the spirit world was strong, it might’ve made all the difference in a person’s will to live. If you’d like to learn how to identify some of our local clubmosses, stop by the VIC and take the Browsing Botanist tour of the Rich Lake Trail. The guide booklet, which you can pick up at the front desk, will introduce you to these groundcovers. Once you’ve made their acquaintances, you will start to see them everywhere as a new window into the wild opens before your eyes. 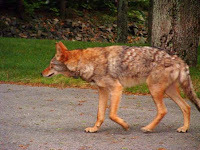 A new study by scientists from the New York State Museum shows how local coyotes have evolved to be bigger and stronger over the last 90 years, both expanding their geographic range and becoming the top predator in the Northeast – by interbreeding with wolves. The study of eastern coyote genetics and skull morphology demonstrates that remnant wolf populations in Canada hybridized with coyotes expanding north of the Great Lakes, and helped turn coyotes from mousers of western grasslands to deer hunters of eastern forests. The resulting coy-wolves are larger, with wider skulls better adapted to killing lager animals like whitetail deer. Dr. Roland Kays, the state museum’s curator of mammals, and Dr. Jeremy Kirchman, curator of birds, co-authored an article on their research that appears in the peer-reviewed journal Biology Letters. The other author was Abigail Curtis, who conducted the study an undergraduate at SUNY Albany, and is now a graduate student at UCLA. According to the study’s authors “the North American coyote evolved as a hunter of small prey in the Great Plains, but rapidly colonized all of eastern North America over the last half-century.” Earlier research had suggested that the spread of agriculture and the extinction of wolves aided coyote expansion, but the question of as to whether remnant wolves and coyotes interbred remained unanswered until now. The research also indicates that whitetail deer accounted for about a third of the coyote’s diet and they have made extensive use of forested areas. The State Museum has the longest continuously operating state natural history research and collection survey in the United States, It was begin in 1836 – you can read more about that here. NCPR addressed the issue of coy-wolves in the Adirondacks back in June, but this is the first study to parse out the local genetics. Photo: A coy-wolf, courtesy Eastern Coyote Research. Are you one of those people who, when driving down the Northway, notices the various colors of the grasses growing in the median? If you aren’t, then you should slow down a bit and take a peek, for this time of year, especially in the early morning sunshine, they are quite beautiful: clouds of delicate purples, patches of russet oranges. I find it very tempting to pull over, get out of the car, and wade in amongst them. Since I’m sure the state troopers are not as likely to share my enthusiasm, I never have. Grasses have caught my attention for years. They have wonderful flowerheads (inflorescences) that come in a great many varieties, and the colors, when seen en masse, can be quite the delight for the eye. I actually love to see lawns that have been allowed to go wild, for they fill an otherwise boring green expanse with delightful colors and textures. Recently I was out botanizing with a friend who, among other things, really knows her grasses and sedges. Most of us wouldn’t know the difference between a grass, a sedge, or a rush if our lives depended on it. Sure, perhaps we recall the rhyme “Sedges have edges and rushes are round, and grasses have nodules where elbows are found” (or some variation thereof), but in practice, they all look like “grass” to the untrained eye. I asked my botanically-inclined friend if she knew of any good books for grass ID, but she said no. I, however, have two grass ID books in my rather large collection of natural history books. One I’ve had in my Naturalist Daypack for quite some time, but I’ve never taken the time to actually read it. Until now. Inspired by my friend’s knowledge, and never one to want to be left behind in the proverbial dust, I decided to crack the book and learn me some grasses. As with many natural history and species ID adventures, at first it seemed intimidating, an almost insurmountable task. They all look the same! I’ll never be able to tell them apart! But by taking the time to actually read the text, the small details, those clues that tell one species from the next, soon become apparent. To begin with, many sedges, but not all, have triangular stems (edges). Many rushes have cylindrical, or round, stems. And grasses, as a whole, have joints, or nodules, where their leaves join the stem. After learning this, you can start to study some of the other distinguishing factors. The book I’m currently reading, Grasses by Lauren Brown, starts off with a dichotomous key, which many people find intimidating, but which I find a relief to use. From there, she’s grouped the plants by visual similarities. The simple pen and ink illustrations point out key traits for quick identification. Unlike many ID guides (try some of the moss or fern books), this one is written for the layperson. Technical jargon is explained – it’s not assumed you are working towards your PhD in botanical sciences. The only real “work” will be memorizing the scientific names. Most real botanists forego common names and with good reason: they are not standardized. What you may call Indian Paintbrush is known as Hawkweed to someone else, and that person applies Indian Paintbrush to an entirely different plant. But the reason for learning the scientific names goes beyond this, for many grasses (sedges, rushes) and other plants, like mosses and lichens, have no common names. The common man has given most of them very little attention, and if you aren’t paying attention to something, you aren’t going to give it a name. If it weren’t for the scientists, these plants would have no names at all. I think that for some time now Grasses will join my Newcomb’s Wildflower Guide as a passenger in my car. I’m actually eager, now that I have inspiration, to get out in the field and start getting to know my grassy neighbors. Armed with my field guide and a hand lens, I hope to soon have names like Anthoxanthum ordoratum and Cyperus esculentus tripping off my tongue. We birders (those who watch birds) eagerly await an e-mail that comes about this time every early fall. It’s a message that’s filled with information that can be good news or bad news. The good news can fill a birdwatcher’s heart with anticipation of a wonderful winter with colorful sightings. The bad news can mean a not-so-good winter with few of these colorful sightings. However, the bad news for us in the Adirondacks turns out to be good news for others. All this I am referring to is the long-awaited Winter Finch Forecast given by naturalist/ornithologist Ron Pittaway of the Ontario Field Ornithologist group: www.ofo.ca/reportsandarticles/winterfinches.php » Continue Reading. Are Dragonflies Disappearing this Year? Lots of folks have commented to me this summer that they haven’t been seeing many dragonflies. Hm. I’ve seen lots of dragonflies (and damselflies) this year, and I haven’t been able to think of any reason why dragonflies would be sparse; after all, it was good and wet this year, so they had plenty of water for successful reproduction and growth. All the rain also meant a lot of habitat for mosquitoes and the other insects that make up their diet. Maybe numbers were down in some locations because it was also a cool summer. 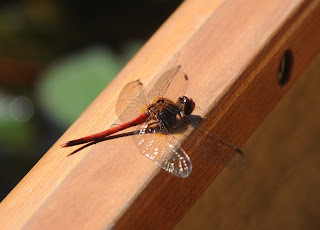 Like all insects (that I know of), dragonflies need sunshine to get the blood moving (so to speak). This is why you see them basking in the sunshine. Just like people, when they get too chilled, they cannot move well, making them easy targets for other predators. Perhaps some of the species that we see in July and early August never got warm enough to successfully emerge as adults. I just don’t know. I can tell, you, however, that September has been a great month for dragonflies. I’ve seen squadrons flying in formation over the streets and roads, phalanxes patrolling yards and parking lots, and down on the water the air has been filled with non-stop dragonfly action. I’ve been very lucky this month to put my canoe on the water several times. This has put me smack in the middle of the action. Most prominent among the Odonates (the order of insects known as dragon- and damselflies) I’ve been seeing this fall are pairs of yellow-legged meadowhawks (Sympetrum vicinum) flying around in their mating embrace. As with all dragonflies, when the male encounters a likely female, he grasps her by the head. It sounds worse than it really is. The male uses a special grasper at the tip of his abdomen (tail) to grab the female just behind her enormous eyes. They are now flying in tandem. The female then bends her abdomen around to receive the sperm packet from the male. You’ve probably seen pairs of dragonflies in this loop formation; now you know what’s going on. Sometimes after fertilization the female lays eggs with the male still attached to her head. Other times the male flies away, his work finished, and the female, who can store sperm for a very long time, eventually lays her eggs on her own. If you see a dragonfly flying along and repeatedly tapping its abdomen to the water, that is what she’s doing. The eggs eventually hatch, and the emerging nymph begins its life in the water, where it is a major predator of other aquatic invertebrates. Depending on the species, dragonflies remain in the nymph stage anywhere from one month to five years! As they grow, they molt, just like caterpillars and other larvae. Eventually, however, they emerge from the water for a final molt, in which they transform (metamorphose) into their adult forms. One of the latest dragonflies of the season around here is the large common green darner (Anax junius). 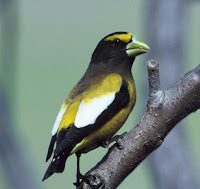 It is the first to appear in the spring, and often the last to disappear in the fall. If you find yourself in need of a dragonfly fix, get down to your nearest wetland and have a seat. A little patience is all you need, and before long you will see these flying wonders zipping and zooming all around. Adirondack Almanack is delighted to announce that Brian McAllister is joining the site as resident bird columnist. Brian is a naturalist, educator and one of the Adirondack Park’s most dedicated birdwatchers. His interest in all things avian often takes him beyond the Blue Line (two trips to Cape May this fall alone). Starting tomorrow, Brian will post birding news every other Thursday at noon. We feel very lucky to know him and to introduce him to Almanack readers. In his professional life Brian has taught ornithology lab and how to interpret habitats at Paul Smith’s College. The Saranac Lake resident has been involved for six years in an Adirondack boreal bird survey for Wildlife Conservation Society. He also served as a natural history consultant to the Wild Center, a naturalist with the Adirondack Park Visitor Interpretive Centers and the Adirondack Mountain Club, as well as field assistant with the Adirondack Cooperative Loon Program. He helped the Adirondack Trail Improvement Society design a natural history education program and is one of the founders of the Great Adirondack Birding Celebration. Brian is a contributor to the Adirondack Natural History blog and has his own site, Adirondacks Naturally. He’s also just the best guy to take a walk in the woods with. He notices things most of us don’t, knows what they are and is able to open your eyes and ears to them in a way that never leaves you. We welcome him to the Almanack. In time for the opening of Pheasant Season October 1, the New York State Department of Environmental Conservation (DEC) will be stocking easily accessible areas where upland game bird hunting opportunities are generally limited. 2,500 pheasants will be distributed at locations in six counties. A second stocking will occur later this season. Since some of the locations are on private land where the public is allowed to hunt, DEC asks hunters to maintain cooperative relationships with landowners by keeping hunting groups small, seeking permission, avoiding driving through fields or blocking roads or driveways, and staying in areas where public hunting is allowed. For the third consecutive year DEC is providing a Youth Pheasant Hunting Weekend on September 26-27 to provide junior hunters (12-15 years old) an opportunity to hunt pheasant the weekend before to the regular season begins. Listed below are pheasant stocking locations by county in DEC’s Region 5. “YH” indicates a site stocked prior to the youth hunt weekend and “RS” indicates a site stock prior to and during the regular season. * NOTE: Monty Bay Wildlife Management Area will not be stocked due to better pheasant habitat at Lake Alice. * Eldridge Swamp State Forest in the Town of Jackson (YH & RS) – note that Eldridge Swamp is often wet, knee boots are recommended. For further information on pheasant hunting and release sites contact the DEC Region Wildlife offices at 518-897-1291 (Ray Brook) or 518-623-1240 (Warrensburg) or visit the DEC web site at www.dec.ny.gov/outdoor/9349.html for more information on pheasant hunting. Last night the Weather Gurus predicted a low of 25 degrees Fahrenheit for Newcomb. Brrr. In anyone’s book, that is chilly. Thanks to a wet growing season, followed by a very dry September, I find that my garden has needed very little in the way of frost protection. With the exception of a couple pumpkins, this year’s garden is unconcerned with crisp weather. But perhaps your garden is a different story. Are you one of the lucky few who have tomatoes? Perhaps you have squash and corn still ripening. Or maybe you put in some late season veg, like kale or other greens. If you fit into this category, then you’ll want to be alert for freezing forecasts and ready to ward off Jack Frost. Some veg are hardy and can take the cold. In fact, there are veg that improve with cooler temps, like carrots. Many a gardener has claimed that carrots only get sweeter with the cold. I’m testing this theory this year by leaving most of my carrots in the ground as late as possible. But other veg are more tender and in need of some TLC if they are to survive. Over the last couple of years I’ve invested in floating row covers. These fibrous white sheets come in varying thicknesses depending on the amount of protection you desire. The thicker the cloth (heavier the weight), the more protection. This is beneficial for frost protection. Row covers also reduce light transmission, so in the springtime lighter weight material might be preferable so that the plants can get enough light to sprout and grow. A cheaper alternative to agricultural row covers is bed sheets. Sheets, towels and blankets sprout in many a garden with fall rolls around. Like row covers, they are draped over plants and pots, keeping the frost from killing tender leaves and fruits. A key to remember here is that you don’t want your cover to touch the plants. The cover is acting like a roof and walls, keeping the warmer air of the day trapped around your plants, and keeping the cold air of night away. If the cold air can get under your blankets, or if your sheet is touching the plant beneath it, the cold can still cause damage. Usually, though, I find that by the time killing frosts arrive, the thrill of the garden has faded somewhat. The novelty of picking beans and making tomatoe sauce has worn thin. I go out and drape tender plants with sheets, row covers, blankets, using clothespins to hold them all together, but if the frost sneaks in and kills the beans and tomatoes, I find I can get over it pretty quickly. Usually it’s the still unripe winter squash and pumpkins that that merit the most attention. You could go the route of The Fan. The idea here is that the fan draws the warm air up from the ground and sends it out over your plants, displacing the colder night air. Or you could try misting your plants before night settles. There’s a claim that misted plants will develop an outer layer of ice crystals that will protect the rest of the plant from damage. Hm. Then there are smudge pots. These essentially create localized smog, which traps heat and keeps the plants from freezing. If you have only a few plants that need protection, there are some nifty options out there that you can try. One is called a water wall. This plastic device is essentially a plastic cylinder that you place around your plant. The cylinder is made of pockets/tubes that you fill with water. During the day the water absorbs heat, which at night is released slowly, keeping the plant within its embrace nice and warm. At about $12 a pop, this can be expensive if you’ve got, oh, say 90 tomato plants to protect. We used a similar but much cheaper option in the greenhouse where I used to work in New Jersey. We brought in our empty milk jugs and filled them with water. During the day the heat of the greenhouse warmed them up, and at night they released that heat, keeping the inside temps relatively steady as the outside temps fell. I’m sure it would work just as well in a garden, especially if you covered the plants and sun-warmed jugs with a sheet. Straw bales can also provide your garden with some protection. Stacking up bales around your sensitive plants will block the outside air. Toss a blanket, or old window, or a frame covered with plastic, across the top and you have a temporary greenhouse (or cold frame) that will serve you well. Gardening in the Adirondacks can be tricky even in a good year. With frost possible in June and August, we are left with only a few short weeks to breathe easily in the belief that our plants are safe. But with some careful planning (the selection of seeds and plants, the layout of the garden, the construction of cold frames, a collection of plant protectors), we can extend our season and eke a few more days or weeks out of our harvest. And if you really want to get into it, you can build a greenhouse, or a high tunnel system, that will permit you to have harvests all year ’round…but that’s another story. When I came back from my vacation in early August, we had an impressive addition to the Visitor Center’s building: a large hornet nest. Apparently it was already under construction back in early July, but it was small enough then that it escaped my notice. But by the second week of August it was over a foot long, and it has continued to grow since then. Many visitors have commented on the impressiveness of this nest. As one walks down our driveway to the building, it is often the first thing one sees. For a while, it even looked like a sculpted face of a woman, created by some long ago master of the marble form. Today it looks more like the face a man, with a big bulbous nose and a serious frown. Most visitors call it a paper wasp nest, and that is not surprising, since paper wasps also create papery nests on buildings. But this nest was made by bald-faced hornets, and I’ll share with you some of the differences between these insects. First off, paper wasps, yellow jackets and bald-faced hornets are all technically wasps, and they are all in the same family: Vespidae. Members of this family are distinguished from other wasp families by the way their wings are held when at rest: folded and slightly to the side. They all have similar life cycles. The fertilized queen overwinters and come spring she sets out to build a small nest from masticated wood fibers. After a few cells are built, she lays her eggs inside. The larvae hatch, the queen feeds them, and when they pupate, the queen has a few helpers, all of which are sterile females. More cells are built by the queen and her staff, and the queen lays more eggs. This continues throughout the summer. As the season winds down, the queen lays a final batch of eggs that develop into males and non-sterile females. The old queen and her workers die off, the new queens mate with the males, the males die and the now-fertilized queens seek shelter for the winter and await spring. The major differences that you and I will notice arise in the structure of the nests. Paper wasp nests are a series of cells that are exposed to the elements. Picture a papery honeycombed structure – that’s about it. The queen makes it by chewing up bits of wood and other fibers and forming them into cells. Hornets build cells, too, but their cells are covered with an external wall – the upside-down tear-shaped papery nest that we see in trees and under our eves. Yellow jackets build their nests underground, and like their cousins the hornets, they surround the cells with papery walls. Most of these insects are black with yellow stripes, but the nest at the VIC was made by bald-faced hornets, Dolichovespula maculate. These insects are distinctive because they are black and white. If you look closely, you will note that the face of each of these hornets is also white, hence the name. “Bald” does not mean “hairless.” Well, it does today, but the original word was “probably from Celt. bal ‘white patch, blaze’ especially on the head of a horse or other animal,” according to the Online Etymology Dictionary. So, “bald eagle” means white eagle, “bald-faced hornet” means white-faced hornet and so on. Bald-faced hornets and yellow jackets are notorious for their aggressive nature. Like many people, they have a large personal space (around the nest), and if you enter it, be prepared for retaliatory actions. If you see these insects just flying around in gentle weaving patterns, they are probably foraging and not interested in you. In fact, bald-faced hornets are actually considered to be rather shy when not defending the nest. If, however, they are flying directly at you, and at great speed, then you know they mean business, and it is time to make yourself scarce. Good luck. As the chilly nights of autumn approach, activity slows down at wasp nests. Nests built in or near the ground often become food for other animals, like raccoons and bears. Once temperatures have hovered around freezing for several days and nights, it is likely that any remaining insects inside have perished. Now it is safe to remove the nest, and even to take a look inside. 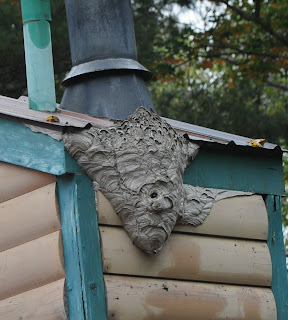 Old wasp nests make interesting decorations in houses, and great educational tools, espcially for children. A post script to our series on wildflower bloom dates: we’ve received a copy of a new book by Chestertown-based photographer Curtiss M. Austin called Adirondack Wildflower Portraits. Last year, over the course of a single spring-to-fall season, he photographed flowers within a mile of his home and organized 60 of them chronologically, by the date he found them in bloom. The book is more album and almanac than field guide, though Austin provides Latin names and a few facts about each species. It won’t help you key out a flower but it might surprise you. The photographer pays as much attention to the diminutive and ignored blooms of plants like common mullein, cow vetch and curly dock as he does to blue flag irises and day lilies. “Many wildflowers are very small, but close-up they are just as interesting and beautiful as larger flowers,” he writes. The 130-page 8″ x 8″ paperback will be available soon at Amazon.com and at Austin’s website for $19.95. The other day I was paddling a peaceful lake with a friend, poking around a pocket wetland along one of its shores, when I came across a lone leatherleaf plant (Chamaedaphne calyculata). It stood out for two reasons: one, it was all by itself, and two, it was knee deep in water. Leatherleaf, also known as cassandra, or dwarf cassandra, is a classical denizen of bogs, although it is often also found on the edges of wetlands, where the water from a pond or lake starts to turn acidic. Typically, leatherleaf moves into bogs after sphagnum mosses are established, making it an early pioneer of these wonderful wetlands. One of its functions is to extend the edge of the peat mat, creating more bog habitat as it goes, thereby giving other plants a toehold in the soggy environment. Because it reproduces by sending out new sprouts from specialized roots and branches (as well as by seeds), leatherleaf forms dense colonies of clones, sometimes as dense as 200 stems in a single square meter of space. If you thought witchhobble could trip you up, you should try pressing through a stand of leatherleaf! In the broadest sense of the term, leatherleaf is an evergreen shrub. 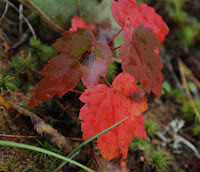 Some of its leaves fall off in autumn, but many of them persist for an additional year. None remain on the plant for a second winter. But what really stands out about the leaves is their variation. 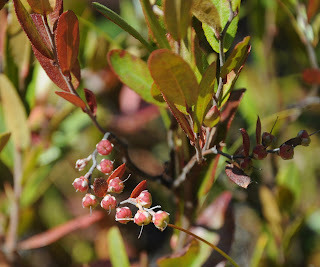 On most of the plant, the leaves are tough, leathery, and olive-drab, and they have an almost vertical orientation on the plant’s stems and branches. But if you look at the top of an upright stem, a rather droopy horizontal twig arises with much smaller leaves. This stem produces the flowers and fruits of the year. Come fall, the leaves drop, the fruits are eaten, and the stem shrivels up and dies. Right now you can go out and find leatherleaf bedecked with ripening berries on its many horizontal twigs. In the spring, you will find leatherleaf in its other beautiful form: hung with many delicate white bells along its horizontal branches. If you are lucky, you may see its chief pollinator, the bumblebee, fumbling around each dangling flower. As the season progresses through summer, other insects visit this plant, although few are considered pests. Look for the foamy blobs of heath spittlebugs, which, like other spittlebugs, have whipped the sap of the plant into a protective frothy coat. You might also find leafhoppers, leaf miners, or even cyphon marsh beetles. This time of year it is easy to find copious spider webs tangling the upper branches; they make for some great early morning photography. The dense stems provide shelter for larger wildlife as well, such as nesting ducks. Leatherleaf is such an unassuming plant, yet for grouse within its range its berries and buds are an important food source. White-tailed deer and snowshoe hares are also dependent on leatherleaf for food in winter, the former eating the twigs and leaves, the latter the twigs and bark. Not to be outdone by wildlife, humans have also made use of leatherleaf, both as a medicine (febrifuge and topical anti-inflammatory) and as a beverage. To see leatherleaf, or other equally fascinating bog plants, hie thee to thy nearest wetland. If you are timid about getting your feet wet, or if you are concerned about damaging the fragile wetland ecosystem, you can visit wetlands at both Visitor Interpretive Centers (located in Newcomb and Paul Smiths), where wooden boardwalks will take you right up to many wetland plants safely and dryly.